#SS17HACK will be co-located with ITWeb Security Summit 2017 on 16 and 17 May at Vodacom World, Midrand. By attending, you can meet 30 of the brightest young minds in IT today. Register here. The hackathon to be held at ITWeb Security Summit 2017 is extending to the Northern Cape. Spearheaded by Geekulcha, and run in conjunction with ITWeb Events and Snode, it is the first hackathon to take place at ITWeb Security Summit, and is aimed at stimulating and growing skills capacity in information security. Ideas under development at Ideathon. Various organisations are collaborating on the hackathon, where participants will interact and get a chance to be guided by over 500 cyber security minds at the summit. 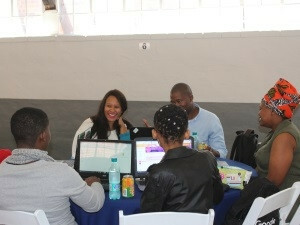 As a first edition, the hackathon will only accommodate 30 people at Vodacom World in Midrand. The Northern Cape Department of Economic Development and Tourism has commissioned a parallel Security Hackathon in Kimberley, on 16 and 17 May, in collaboration with Sol Plaatje University, Geekulcha Student Society (GKSS). The Kimberley edition of the hackathon will be managed by the GKSS and local entrepreneurs from the Diamond Creative Vision Hub. A team of 11 people from the department and GKSS attended the training Ideathon in Pretoria, to get a sense of how to run things. A team from Snode will help the Kimberley edition of the hackathon by providing mentorship to ensure the participants build the most secure solutions possible. #SS17Hack Midrand and Kimberley will be broadcast live to each other, giving a sense of concurrency, although each hackathon will have its own judging process. Visit the gallery for all the Ideathon activities.